This weekend I’m having a terrific lady day with my friend and spending the evening cooking, watching movies and discussing our house remodels. It sounds like heaven to me and it makes me realize that I don’t spend enough time with my friends. I think as we get older and our lives revolve more around our children and husbands we tend to let our friendships fall by the wayside. Taking the time to nurture our relationships with our closet friends makes us more bearable to our own families. I know when I find myself getting short and irritated with my boys it’s time to spend a little time doing something just for me. In our continuing quest to eat dairy free I’m finding myself turning to older recipes that I can adapt and make work without any cheese or milk. My son loves creamy pasta sauces but they are both loaded with heavy cream and lots of cheese. I’ve made this butternut squash sauce before and served it with stuffed shells and used it as a pizza sauce but they both have a lot of dairy in them. 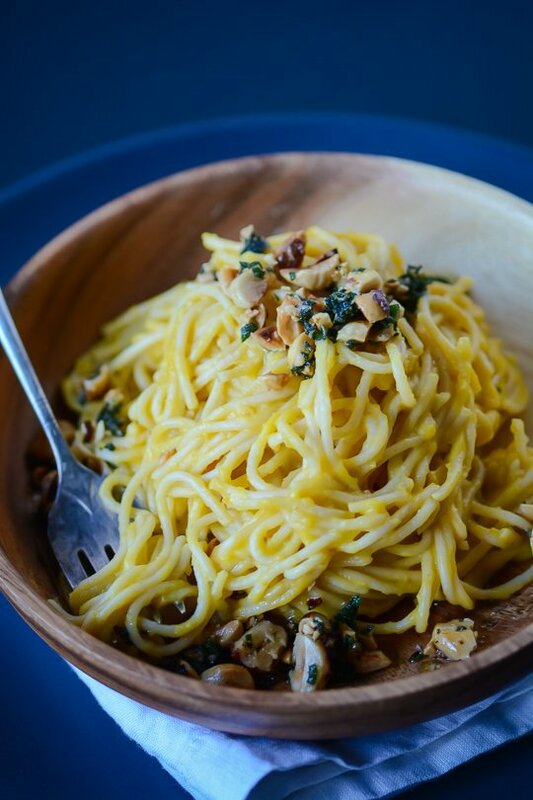 To keep the dish full of flavor I turned to some crispy fried sage and hazelnuts to add a deeper flavor. 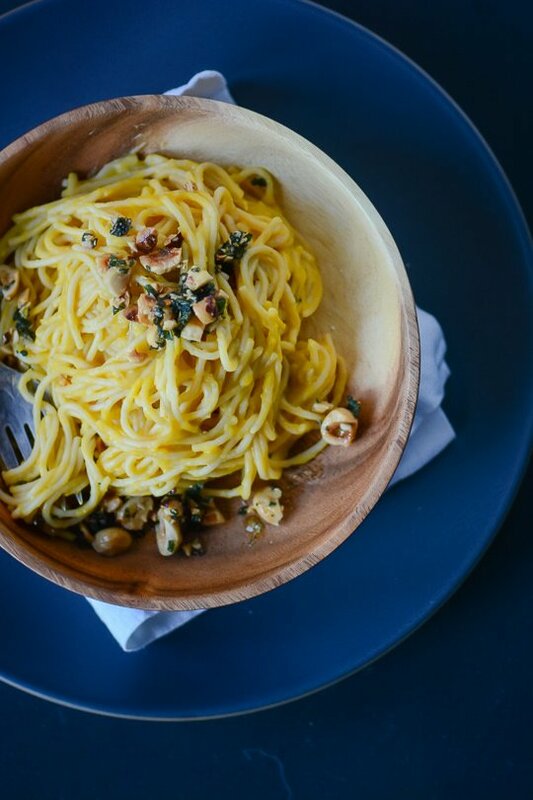 You can definitely top the finished product with a little parmesan or pecorino it adds a nice saltiness and to keep the dish vegan use a tablespoon of nutritional yeast instead. You'll never miss the cheese in this pasta sauce. 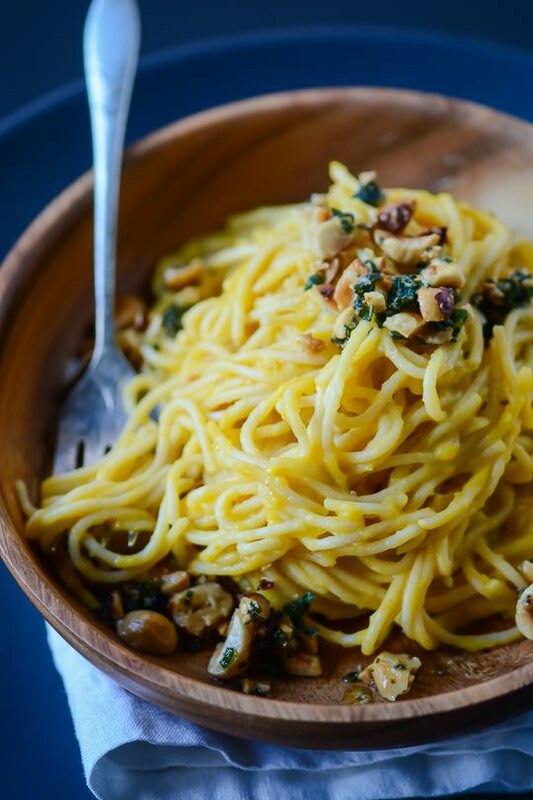 Topped with crispy fried sage and hazelnuts it's a great lighter version of your favorite cheesy pasta dish. 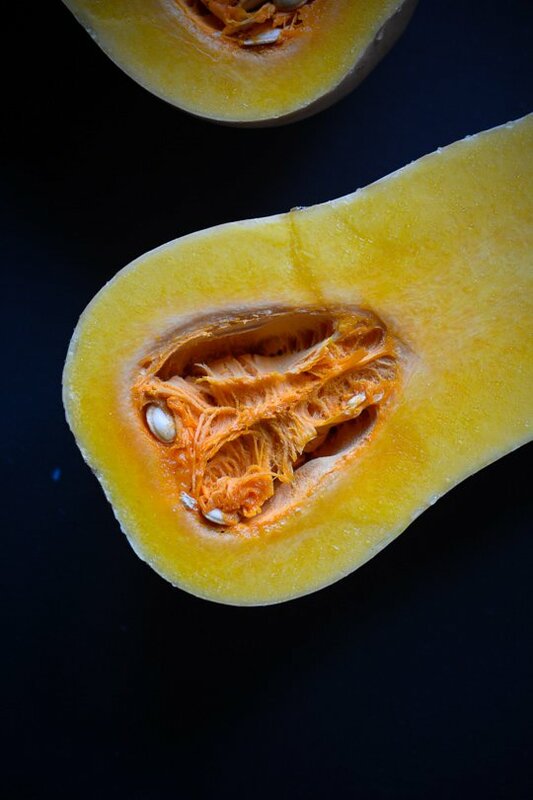 Using a large, sharp knife, trim the ends of the squash and cut it in half lengthwise. Peel with a vegetable peeler. With a spoon, scoop out the seeds and discard. Cut the squash into 1-inch cubes and on a baking sheet toss the squash and shallot with the olive oil, chili flakes and salt. Roast until the squash is tender, about 30 Minutes, tossing occasionally. While the squash is roasting, bring a large pot of salted water to a boil and cook according to the package instructions until al dente. Drain the pasta and reserve 1½ cups of the cooking liquid. 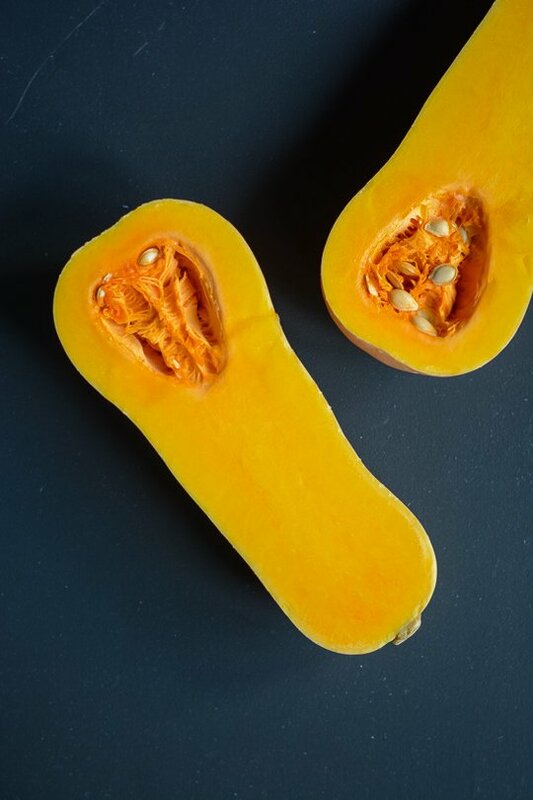 Once the squash is finished cooking, transfer it to a food processor or high-speed blender. Add the apple cider vinegar, almond milk, and reserved pasta water. Process until smooth adding a little more stock if needed to thin if necessary. Taste, and season with salt and pepper as desired. In a small skillet, heat the remaining 2 tablespoons of olive oil over medium heat until the oil shimmers. Add the hazelnuts and cook for 1 minute, then add the sage and continue to cook for an additional minute. Combine squash puree, pasta and a ¼ cup of the pasta water in a skillet and cook over medium heat adding additional cooking water until the sauce coats the pasta, 2 to 3 minutes. Taste and season with salt and pepper. 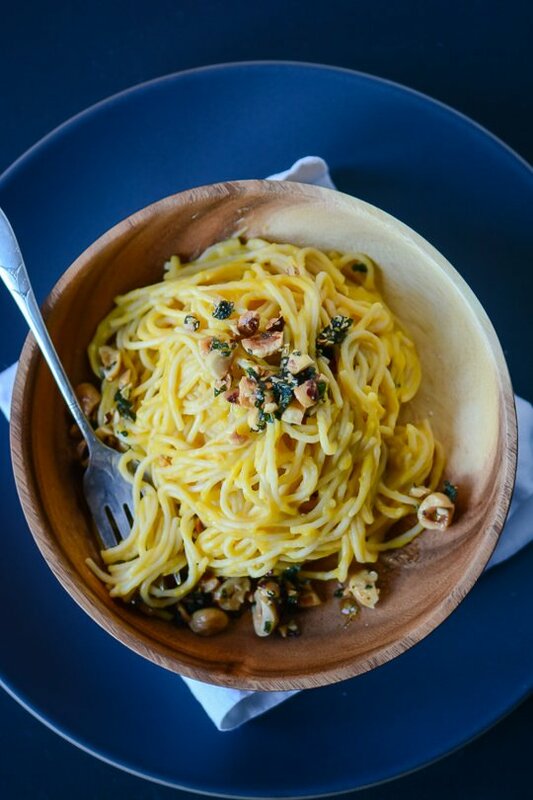 Serve the pasta with a sprinkling of the hazelnut and sage mixture and top with parmesan cheese or nutritional yeast if desired. I love your take on creamy, dairy-free pasta sauces, both this one and several of the ones in your archives. I don’t cook with sage enough but I should be because this looks like the perfect pairing with hazelnuts and the sweet butternut squash sauce. This sounds fantastic! I’m always looking for ways to cut down dairy in my diet because it makes my sinuses less than happy, so this will be a welcome new addition; additionally, we have a ginormous sage plant in the backyard (provided it survives this winter), and we are always looking for new recipes to use it in. I have a question, though- after I half, peel and gut the squash, do I cut it into cubes or leave it in halves for baking? Thank you as always for the delightful recipe! I cut the butternut into cubes when I roasted it, sorry I didn’t make that clear. I’ll be sure to update the recipe! This looks delicious!! I’ve been addicted to roasted squash pastas this winter, but with goat cheese or ricotta : ) I could use a healthier option too. Also, I never puree the squash but I bet my kids would eat it that way, not being able to identify the squash they think they don’t like… anyway thanks, I will try for sure. I always love your recipes. It’s a great way to get the kids to eat some vegetables if they are resistant. Omit the hazelnuts and sage and add a cup of grated cheddar and you have a great substitute for mac and cheese! I hope you enjoy it if you try the recipe!